Kritters Thoughts: Two sisters who have had a troubled past end up in the same home again as adults and the dramas of the past are going to come boiling up and may just explode. Ruth and Millie are two sisters that are complete opposites and they have been battling since their childhood. Ruth is living in Massachusetts and Millie needs to escape New York and with nowhere else to go, Millie retreats to Ruth's house. 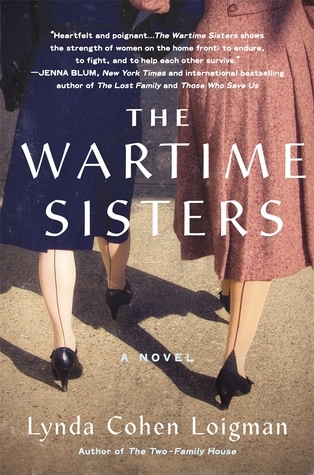 Yes this book is titled The Wartime Sisters, but I would say this book is mostly about the sister relationship that just so happens to take place during a war. Bring a sister is such an interesting and complicated relationship and this book showed that relationship to a T. It was so accurate it was scary! Loigman's writing was so easy to read. I read this book in the middle of December in the middle of the holidays and it was just the right book to curl up with a few times over a weekend. It was easy to pick up and put down and get in and out of this book. There were a few moments where the author repeated something and I was confused that I had heard that detail before, but it didn't take away from my enjoyment of the book as a whole. If you are a reader who doesn't tend to read historical fiction, I would challenge you to try this one, there is more plot that could have taken place at any time in history then there was historical details. Don't get me wrong, it is obvious that this takes place in the 1930s and 1940s and those moments I enjoyed, but this book really focuses on sisters and family.